Puppy Linux Discussion Forum :: View topic - no skype any more for 32 bit systems and 32 bit Linux! no skype any more for 32 bit systems and 32 bit Linux! Posted: Thu 14 Mar 2019, 20:13 Post subject: no skype any more for 32 bit systems and 32 bit Linux! Subject description: don't wonder... it's so! I thought I'd give Puppy another go due to it's portability. Unfortunately it's very complicated in installing software. First thing I tried was to install Skype. There is no simple click to install feature (why not? This is 2019 and we aren't all computer nerds). Maybe I typed the command wrong? I don't think so, but since the terminal doesn't even have a copy and paste feature, it's hard to know. Question is, can I just click to install app?, or shall I just go back to Ubuntu which works surprisingly well on USB and has a lot of GUI these days? - pretty much the only Linux I can bother using. 2 if skype, I always use a 64 bit Puppy! Maybe you can use skype on the web instead of installing it? but (s)he needs Google Chrome to do that and it is rarely the in Puppy pre installed browser! Iron is a perfect 'clone' of Chrome, and lets you do everything, just as you would in Chrome. I forgot all about that! With the latest Chrome based Slimjet (32b), I'm able to reach web.skype.com. all is possible as far as Google can organize some exceptions for Google users only and users from chrome are some kind also Google user else if they did refuse to adhere to Google in other situations (but it is probably rare: For smart phone user is the adhesion to Google some kind of MUSS)! GOOGLE DO NOT RELEASE A 32-BIT LINUX BUILD ANY MORE. THEY BUILD 32-BIT FOR WINDOWS & MACS.....BUT NOT FOR LINUX. CHROME ON LINUX IS 64-BIT ONLY, AND HAS BEEN FOR AT LEAST THE LAST 3 YEARS. 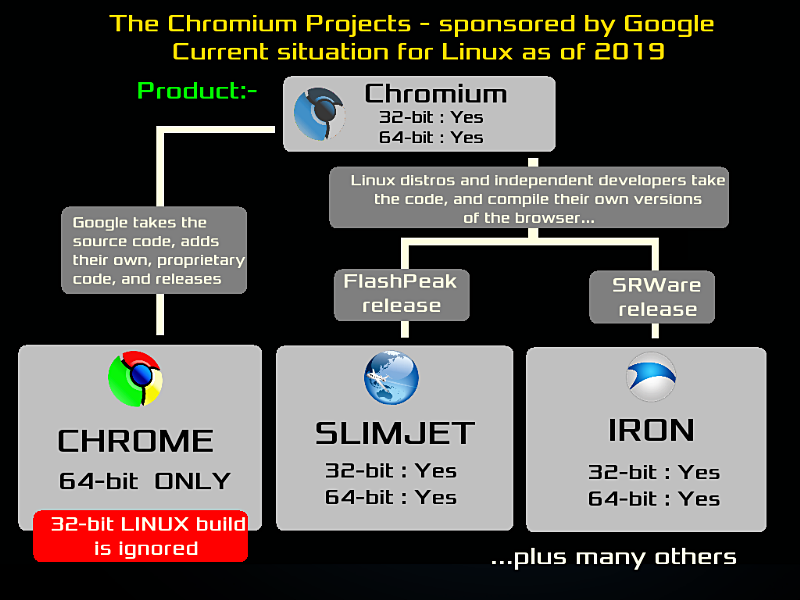 So; what I (and others) are trying to tell you is this:- If you like Chrome, and nowadays want to run it in 32-bit Linux, you'll get the exact same experience if you use SlimJet, Iron or Chromium itself. Please don't confuse these two. Chromium is NOT Chrome.....but if Chromium didn't exist, then neither would Chrome itself. EDIT:- My mistake; I apologize. You appear to be correct; Firefox won't show web.skype.com. Well, that's a fairly recent development; I'm guessing it probably coincided with MyCrudSoft's decision to adopt the Chromium code-base for Edge. Naturally, they want to make sure that their subsidiary (Skype) works properly with their 'flagship' browser (Edge). One wonders how long it will be before they craftily sneak in a snippet of code to prevent anyone using Skype on the web unless they're in Edge already. I wouldn't put anything past them. At all. Try having Firefox spoof Chrome's useragent string, and see if web.skype.com allows it. I don't have Firefox installed at the moment, and have Skype setup over on XenialPup 64, but I tried adding a useragent override to PaleMoon (add general.useragent.override.skype.com in about:config, with the string value "Mozilla/5.0 (Windows NT 10.0; Win64; x64) AppleWebKit/537.36 (KHTML, like Gecko) Chrome/70.0.3538.77 Safari/537.36"). I then visited web.skype.com, and the login page shows. (Without it, I get the 'browser not supported' message.) I don't know how well it works from there, though. You appear to be correct; Firefox won't show web.skype.com. Well, that's a fairly recent development; I'm guessing it probably coincided with MyCrudSoft's decision to adopt the Chromium code-base for Edge. Naturally, they want to make sure that their subsidiary (Skype) works properly with their 'flagship' browser (Edge). That is really bad of Microsoft. Very restrictive. Shocking really. That, my friend, works a treat. And web.skype.com comes up, and signs in again, like it used to a while back. All is fully functional, too (it should be, it's all generated via the website.....it's just MyCrudSoft playing silly buggers again, as usual). I don't use it often, but it's good to know I can use it in any browser now; no having to be in a specific Pup, or using a particular browser, just in case. (Especially since the desktop client is nothing more than the web-client running inside a wrapper; this is why Skype looks identical these days, regardless of where you run it from..) Working nicely in both Fred's Quantum-portable, and my own FF60esr-portable. It seems to suggest that MyCrudSoft's decision to adopt the Chromium code-base may very well push Chrome itself into a near-total market monopoly position, in very much the same way that Internet Exploder achieved during the late 90's and early 2000s. Not a very savoury thought, eh? Despite having been a 'Chrome man' from the very first release back in Autumn 2008, I'm very much a supporter of the concept of Puppians having maximum choice in all things. I use Mozilla-based browsers on the old Dell lappie, even though Chrome will (slowly!) run on there; Palemoon especially, since it's nice & lightweight, and very responsive on an elderly P4 CPU. This is a situation that will bear watching over the coming months, I think. You don't need chrome or anything. Um; well, each to their own, of course. I won't be drawn into a 'which browser is better' type of thing, because browsers are such an extemely personal choice. Like every Windows user, I'd been stuck with Internet Exploder for years. I switched to Firefox as soon as was practical - the first few builds had, um, problems, for sure...... but IE was such a piece of junk that anything at all was an improvement. For a few years I was a diehard FF user, and would defend it to the death, if needs be. Then; ah, hell.....I don't know what happened, but FF went through a prolonged spell where it just crashed all the time, at the slightest excuse. During that nightmare period, the first 'beta' previews of Chrome became available. I signed up as a tester, and pretty much fell in love with it at first use. Fast, responsive.....and nothing seemed to faze it. I've been a Chrome 'fanboi' ever since. Oh, sure, Chrome too has had its crap spells; at times I nearly gave up on it. But in recent years it's just gone from strength to strength. I've partly come back to the FF fold with the release of Quantum. At long last, FF could compete with Chrome on almost equal terms. Quantum is what FF should have been years ago, and no doubt could have been, if only it weren't for all the extended periods of back-stabbing & infighting going on between the Mozilla devs. I've reached the stage where I no longer give a rat's arse which one I fire up; there's that little to distinguish them any more. They're both as good as each other; both are fast & responsive (they've both pretty much solved their 'memory hog' issues).....and both do everything I ask of a browser, with very little drama. As for the 'M$ using Chromium as a base for Edge' thing, well, anything has to be an improvement. I don't know what it is with Microsoft, but they've never appeared to be on more than the vaguest 'nodding acquaintance' with the whole concept of what a web browser is supposed to do.